First built in 1861, the 546 foot long bridge was rebuilt in 1889 by engineer T.H. Barnes who had built New Birmingham, Texas. The bridge had been restored in the late 1960s - on plans left by Barnes. 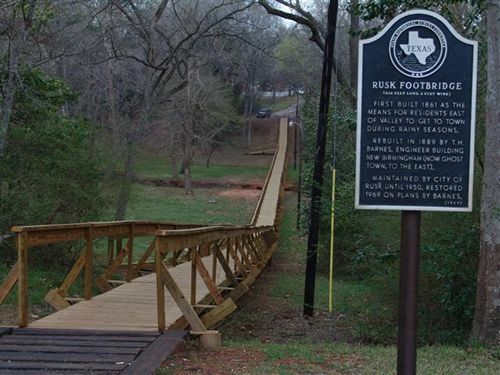 The Rusk Footbridge is believed to be the longest footbridge in the nation at 546 feet. It is located in Rusk, TX, just off the Courthouse square. It is a beautiful point of interest. During the town's early years, before streets connected a residential area with the downtown business district, the bridge served as a means to cross a small valley when the creek flooded. The line runs from 3 miles west of the Cherokee County courthouse square to just East of Palestine. Between the two points is the village of Maydelle with several vintage buildings - including the depot and the former Cushing Hotel. The park at the Rusk end has a lake, boat rental and a comfortable waiting room / museum. The train is made up of vintage coaches with comfortable seating and open windows - all the better to see East Texas up close. The line is cut through the red clay in some places - the same clay that made Marshall crockery and millions of bricks. Jim Hogg Park is 178.4 acres of East Texas Pineywoods east of Rusk in Cherokee County. The property was deeded by the City of Rusk in 1941 and was opened the same year. It is now managed by the City of Rusk. A memorial to the state's first native born governor, James Stephen Hogg, 1891 - 1895. During his term as state attorney general and governor, Hogg revolutionized state government and private business by strengthening public respect for law enforcement and establishing the Texas Railroad Commission to enforce state anti-trust laws and promote fair business practices. In this Pineywoods of east Texas, visitors can enjoy wildlife observations and photography of birds, squirrels, and deer on occasion. You can also experience a great variety of trees and shrubs native to East Texas. We are an all-volunteer, non-profit organization dedicated to the dramatic arts. While we are based in Cherokee County, Texas, we serve the greater East Texas area. educate both youth and adults in all aspects of the theatre and to encourage volunteers to learn and showcase their skills, both on and off the stage. Baptist-owned institution, organized 1895, sitting high atop hill south of downtown Rusk no longer exist. Once thriving, well-rated college. Financial woes, general economy led to closing 1928. In 1997, Thomas L. Parsons, city councilman for Rusk contacted the owners of the property and the owners donated the property to the city as a park with two conditions; one to name the park after them “Butler Park” and the other condition was that no trees would be cut down unnecessarily. Golf Club is a family-owned, 9-hole course in the rolling hills and Piney Woods of East Texas in the small town of Rusk. The course first opened in 1967, and in the following decades it has earned a reputation as one of the best courses of its size in the Lone Star State. In fact, The Dallas Morning News once named it 35th in the "Best Nine Hole Courses" in Texas. There's a reason players have nicknamed Birmingham Forest Golf Club "the toughest little course in Texas." The strategic design tests players on both their decision making and shots. Birmingham's rolling fairways meander around a spring-fed lake and through the woods. All holes have four sets of tees, making it a great play for golfers of many different skill and experience levels. The course also has an interesting history. It sits on what was once New Birmingham, a ghost town that was an iron ore boomtown in the 1800's....thus the name of the course. You can still find the history embodied by the area's antique horseshoes, railroad spikes and arrowheads. You'll love the history, course, pro shop and more found at Birmingham Forest Golf Club. And we can't wait to welcome you to our course! Enjoy this new KOA centrally located between Dallas, Houston and Shreveport in the cooler Texas Piney Woods area, known for its beauty and history. Ride the Texas State Railroad's steam train, walk the longest wooden footbridge in the US, play golf at local courses, ride through a wildlife park, visit a winery…or just kick back and relax. The area hosts a variety of festivals throughout the year. Our hilltop location offers breezes and spectacular sunset views. Our long, 50-amp, pull-thru sites can accommodate the largest RV. Tenters will love our shady sites nestled in the pines. No RV or tent? Enjoy outdoor days and indoor nights in a cozy rustic cabin or a comfortable lodge. Plan an affordable weekend getaway, a vacation, a reunion or rally, and enjoy our saltwater pool, complimentary Wi-Fi, horseshoes, and cycle rentals. Our new climate controlled club room makes this an ideal spot for group gatherings of all kinds ! The park was dedicated in honor of Mr. Irvin C. Conley for his many years of service and dedication to the community as an educator,developer and civic leader. Adrenaline Rush Zip Line Tours a well known and exciting East Texas attraction. As far as ziplines in texas go, this attraction boasts one of the LONGEST Zip lines in TEXAS - the "Adrenaline RUSH Zipline". This East Texas Zip line is approx. 1700 ft. LONG! Just incase you missed it, it is one of the MOST "Fun Things To Do In East Texas"
The mission of the Heritage Center of Cherokee County Museum is to acquire, preserve, and display artifacts of historical significance to Cherokee County, Texas. The museum is located in downtown Rusk, Texas. With the assistance of SFASU’s Center for Regional Heritage Research, the collection features historic photographs of schools, the downtown business districts and the timber industry. A must see if you are in the Rusk area! Rich in History!